How Germany became a thorn in America’s side. In early February, the top financial officials of seven major industrialized countries gathered in Canada to mull the state of the world economy. To grease their interactions, the Canadians had created an intimate setting in Iqaluit, an Inuit town near the Arctic Circle. A planning document waxed on about fireside chats at a cozy inn and decreed that the attire would be casual. It touted an array of cultural activities to supplement the official meetings and even promised the summiteers matching parkas. Many of the middle-aged technocrats embraced the spirit of the occasion, trading in their bankers’ uniforms for chinos. A photo of Mervyn King, the British central bank governor, shows him splayed out on a careering dogsled, sporting a childlike expression of terror and glee. But, amid all the A-list bonding, the Americans seemed slightly aloof. Treasury Secretary Timothy Geithner shuffled through the first day of meetings clad in a dour-looking business suit. (Though he did halfheartedly don a wool sweater the following day.) The U.S. delegation arrived too late to partake in the sledding. The contrast could be interpreted as a sign of things to come. Geithner had been caught off guard by the reach of the Greek fiscal crisis. Heading into the weekend, he and his top international aide, Lael Brainard (now an under secretary at Treasury) were concerned that it could trigger a panic across Europe which, if uncontained, might spread to the United States and Asia. But, when they politely broached the subject with their European counterparts, they encountered a curious passivity. “As the meetings progressed, it was more, ‘Okay, what’s the plan?’” recalls one American official. Much of the problem resided with the Germans. Though senior officials, like Finance Minister Wolfgang Schäuble, were sympathetic to a bailout, their political overseers in Angela Merkel’s chancellery were conflicted. The reality was that, as the continent’s dominant economic player, Germany would find itself heavily bankrolling any such effort. Instead, Merkel’s government preferred to place responsibility on the Greeks, arguing that, if they took the austerity measures the Germans were urging, the markets would calm and the turmoil would pass. “You had to have credible contributions by Greece,” says one German government official, adding that it was the only way the parliament might eventually approve a bailout. The Americans were dismayed. “It’s fair to say ... we were hoping they’d be beyond the realm of thought experiments,” says an administration official. “That they’d be ready with a plan.” But, thanks to the German stalemate, the Europeans were in little position to act. Nor is the European debt crisis the only issue that Washington and Berlin have tangled over of late. For months, top U.S. officials have begged the Germans to stay the course on their modest stimulus measures, fearing that a too-quick withdrawal would hamstring the European recovery and pose risks to the global economy. But the Germans have stood firm, rejecting the administration’s Keynesian logic with rhetoric that can sound gratingly reminiscent of Republican talking points. The Germans even dragged their feet over a stress test of European banks, complicating efforts to restore confidence in the continent’s balky financial system. In normal times, an American president might be happy to leave the Europeans to adapt to this new German posture. But, with the global economy still fragile after the calamity of 2008 and dodgy-looking debt from the likes of Greece and Portugal giving the world’s banks another round of agita, the new, more inward-looking German mindset is creating anxiety in Washington. At nearly 68, Wolfgang Schäuble is an old Christian Democrat of the Helmut Kohl mold—a product of the center-right politics that guided the country’s postwar integration into Europe. Though only twelve years younger, his boss, Angela Merkel, grew up in the communist East, where few were given to dreaming of Germany as the continent’s benevolent hegemon. German politicians of Merkel’s generation tend to be unsentimental. They believe ordinary Germans crave good jobs and sound pensions, not historical missions. As in most matters European, one telling divide involves the French. German politicians of the Schäuble persuasion tend to think reverentially of their neighbor to the west. Their preferred metaphor for the relationship is “rider and horse,” with the French as the rider, the source of political leadership, and the Germans as the horse, providers of financial wherewithal. By contrast, Merkel and her ilk are less apt to think of the French as statesmen than as moochers and meddlers. In their eyes, “free rider and horse” might be more like it. Even at the height of the cold war, the U.S.-German relationship was hardly seamless in the realm of economic affairs. For decades, the Germans cultivated a reputation as the tightfisted disciplinarians of the international system, leaving American administrations chafing at their Teutonic intransigence. But, as long as Schäuble and his predecessors were at the helm, Germany was reliably generous when it came to Europe, giving Washington one less geopolitical headache to worry about. A succession of German governments made European integration possible by transferring enormous wealth to the continent’s periphery. “All through the decades after World War II, the leaders were saying to their German compatriots, ‘We must be ready and willing to pay the bills at the EU level. It’s our passage back into the community,’” says Jackson Janes, an expert on U.S.-German relations at Johns Hopkins University. Germany also set aside its geopolitical ambitions in favor of nato, whose forces it housed. In the late ’90s, Kohl gave up the deutsche mark for the euro, lending the country’s hard-won financial credibility to the continent’s lesser economic lights. This was not something that tickled the average German. It’s only over the last ten years, with the Soviets gone and unification largely behind it, that Germany has become as content as it is prosperous. The distant past no longer weighs on its leaders’ every waking thought. On questions of Europe, German politicians have begun to resemble pretty much every other kind of politician: self-interested, opportunistic, and highly solicitous of public opinion. For example, one of the conditions the Germans imposed on their neighbors in return for accepting the euro was the so-called Stability and Growth Pact—a strict limit on the deficits a eurozone country could run. In 2002, after the Portuguese had violated the limit, the Germans insisted on a review process designed to prune their deficit. The following year, after the Germans had breached the limit, they simply told the nominal authorities in Brussels to buzz off. It was a move that rankled the rest of the continent—akin to watching your father take away your brother’s cigarettes ... and proceed to smoke them himself. The new attitude pervades more than just the political sphere. Last year, the German constitutional court handed down a ruling challenging the validity of a prominent EU treaty on the grounds that it was undemocratic. As a practical matter, the ruling meant Germany was assuming the right to pick and choose which EU laws it would abide by, something no other European country has claimed. On the evening of Sunday, May 9, officials from France, Germany, and Britain were holed up in Brussels haggling. The panic that had started in Greece was spreading across the continent, and the negotiators were desperate to stop the contagion. Every so often, one would join a conference call with senior financial bureaucrats from the United States, Japan, Canada, and elsewhere in Europe to update their progress. This continued until around eleven o’clock, at which point the updates abruptly ceased. For the next few hours, there was silence on the Brussels end of the line. “Why can’t they make up their minds?” European Central Bank president Jean-Claude Trichet wondered aloud at one point. Nobody wanted to find out what would happen if the Asian markets opened before a plan was finalized. One participant recalls privately despairing that the world economy was toast. If there had been a way to avoid this financial cliffhanger, it’s not obvious what it was. From the outset, the watchword at Treasury had been “humility”—it being a Geithner tenet that lecturing other countries on their own self-interest is futile at best, and often counterproductive. It was a view Brainard shared. She’d been the top international economic official at the White House during the Asian crises of the late ’90s and had pushed back when Treasury tried to micromanage the afflicted countries. Throughout the winter and early spring, Geithner and Brainard had generally held back, content to ask pointed questions of the Europeans rather than lobby for a particular outcome. By late April, no amount of wishful thinking could hide the fact that Greece was plummeting, and the Germans reluctantly blessed a $150 billion loan package long championed by the French. The problem was that the turmoil now extended all the way to Spain—a major economy with debt socked away in banks on several continents. If Spain defaulted, it could mean a Lehman-like catastrophe. The Americans began urging the Europeans to enact further-reaching measures, not simply put out fires as they ignited. But, according to one American official, there were “political constraints.” If nothing else, the German parliament first had to endorse the Greek deal, no certainty. “I think there was always the hope that [Greece] would be it,” says Brainard. One German government official working in this area says he found the Americans pushy during this time. Bertrand Benoit, a spokesman for the German finance ministry, says the discussions were constructive: “Their views were made very clear to us,” he recalls, “but it wasn’t anything that we would interpret as being pushy or unwarranted.” Whatever the case, the practical effect was to nudge the Germans along. In the 24 hours between Saturday, May 8, and Sunday, May 9, Geithner and Brainard talked them up by a factor of ten. 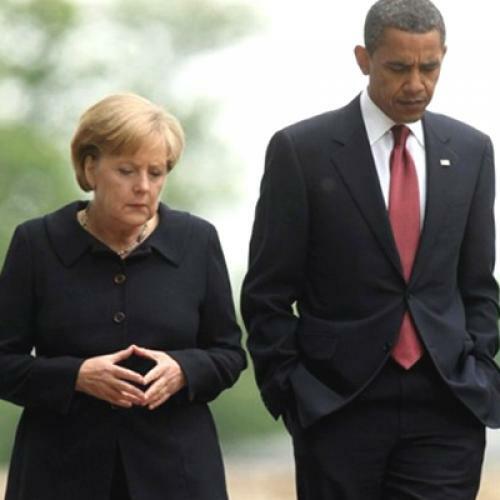 Barack Obama helped close the deal with a personal call to Merkel. The Europeans would mobilize roughly $630 billion, the IMF another $320 billion. All that was left to sort out was the way the money would be structured. Merkel chafed at any rescue fund controlled by Brussels but heavily financed by the Germans. She favored loans bundled together from individual countries, which would allow the Germans to dictate terms because they’d be making the largest contribution. Bolstered by the Americans, the other European countries insisted it wouldn’t work. Finally, sometime after two o’clock in the morning, they struck a Rube Goldberg compromise: The bailout fund would be financed by bonds sold to private investors and backed by individual governments. As the strongest economy in Europe, Germany would be on the hook for most of the debt, but it would enjoy a measure of control. The Germans choked it down grudgingly. In truth, they had reason to be skeptical. The exorbitant interest rates private investors had charged countries like Greece and Portugal reflected an outsize risk of default. Rather than bailing them out, a preferable solution might have been an orderly restructuring—foisting some losses on investors if the borrowers couldn’t pay. But, even if you think such a response was workable (and not everyone does), it takes time to arrange. By ignoring the problem for so long, the Germans left themselves no chance to pursue that option. There’s a danger in making too much of any one episode, of course. “Countries having financial crises go through the same phases that people diagnosed with serious illnesses do: denial, rage, bargaining, and acceptance,” says Larry Summers, the top White House economic aide. “It takes time.” Perhaps it would be more surprising had the Germans been an exception. But it’s more than just the recent debt crisis. A few weeks after the ink dried on the May 10 deal, Geithner and Brainard traveled to Europe to promote a version of the stress tests that regulators had inflicted on American banks last year. The exercise involves projecting how a bank’s balance sheet might perform if the economy were to weaken. This bolstered the U.S. financial sector by helping investors distinguish between healthy and unhealthy banks instead of shunning them indiscriminately. Geithner and Brainard believed European banks could benefit from a similar exercise, given that market indicators suggested investors (and other banks) were still eyeing them all warily. One major sticking point was transparency. For the tests to be useful, investors needed a detailed, bank-by-bank picture of where the land mines lay. Though some in the government were cooperative, key German regulators resisted, particularly when it came to holdings of Greek debt. They invoked national laws saying they couldn’t force banks to disclose information. German officials also suggested to reporters that the real problems were in Spain, where a real-estate bust had pummeled the banks. “The Spaniards were very upset about that,” says Jacob Funk Kirkegaard of the Peterson Institute for International Economics. “They felt actually the German government leaks forced up the bond yields of Spanish treasuries.” In fairness, the Germans were hardly the only ones talking down other countries’ banks. But, in a sense, that’s the issue: There was a time when the Germans didn’t behave like everyone else. And then, there’s the matter of stimulus. The Americans and Germans spent a stretch of the spring debating the right time to close the stimulus spigot and start narrowing their deficits. The Americans, haunted by the Great Depression, worried that countries would cut back too quickly and relapse into recession. The Germans, haunted by their own interwar experience, worried that deficits would lead to a debilitating inflation. On one level, this debate is nothing new: Policymakers in the United States and Germany have made variations on these arguments for decades. Likewise, as the Germans are quick to point out, they’re not reining in their spending as quickly as the rhetoric suggests. The Germans have narrow, technical reasons for this position—some of them quite reasonable. But the more basic reality is that Germans no longer see their prosperity tied so closely to the continent. One increasingly common refrain in Germany these days is a call to focus on brics, not piigs. The idea is that, because its neighbors lag so far behind economically, Germany must look beyond Europe (“piigs” literally refers to Portugal, Ireland, Italy, Greece, and Spain) to markets in Russia and China (“bric” stands for those two countries, plus Brazil and India), where it has flexed its muscles of late. If other European countries want to follow its lead overseas, all the better. But Germany can’t slow down to help them catch up. At the broadest level, the German experience of the last decade is an object lesson in the upshot of “normalization.” As Germany has become a more normal country—less burdened by guilt, more comfortable pursuing its self-interest—it has behaved in ways that are less helpful to Europe and, by extension, the world. But, on balance, the global economy stands to gain more from any normalization trend than it loses. After all, the other major candidate for “normalizing” is China. Whereas the Germans were unusually enlightened, the Chinese have been unusually disruptive—manipulating their currency, stealing intellectual property, and generally flouting international norms. According to one view, that may be changing on matters of economics: The Chinese stimulated their economy aggressively when it counted, they’ve started letting their currency appreciate, and they’ve talked of encouraging their citizens to consume more imports. The question is whether China can save us before Europe buries us. And on that question, the jury is decidedly out.